If you use chocolate milk mix, powdered drink mixes, or protein powders, a good Shaker Bottle (like this one on sale on Amazon) is a must. 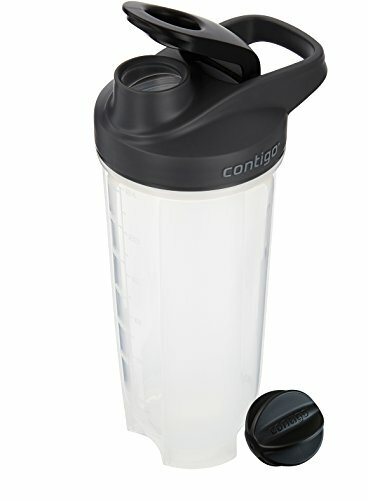 Hurry and get the Contigo Shake & Go Fit Snap Lid Shaker Bottle, 28 oz, Black today for $13.49 NOW only $6.94 from Amazon! Save BIG! This product has many variations at different prices! Quickly see them all here. Check out all of the Amazon deals here! Get FREE shipping (2-day for Amazon Prime members) when you purchase $25 or more of eligible items across any product category. Get the Shaker Bottle details below. From masterfully mixing protein powders to more adult drinks on your cheat day, this larger capacity Shake and Go Fit protein shaker bottle has your nutritional needs covered. This shaker cup engineered for no mess mixing and easy cleaning so you can spend more time stretching at the gym, not scrubbing your blender bottle at the sink. Buy the Contigo Shake & Go Fit Snap Lid Shaker Bottle, 28 oz, Black from Amazon.